W.M.L. de Wette (1780-1849) was not only one of the founders of modern Old Testament criticism. His loss and recovery of Christian faith, his dismissal from his post in Berlin in 1819 on political grounds and his long subsequent exile in Basel left their mark upon his work in New Testament ethics, dogmatics and aesthetics. 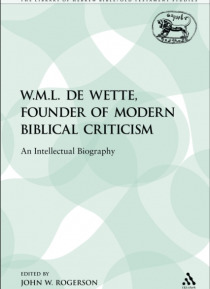 This first modern critical study of de Wette's life and work evaluates his … achievements in the context of his own times and asesses their importance on modern biblical scholars.